The game we reviewed is a cooperative game called Save the Pie. The players work together to keep the pie away from the hungry bear. This game encourages team work and problem solving with a healthy dose of silliness thrown in which makes it a super fun game! A and D are 7 and 5, so I helped them set the game up and read through the directions, but they were definitely able to play the game by themselves. They really loved it! The game is a mixture of rolling the die and completing physical and mental challenges all set to a timer. One of their favorite parts, shown below, was blowing the berry chip across the board:) There are various levels of play for beginners to more experienced players, though we have yet to be able to win on the hardest level. The kiddos have played this game several times in the past week and it has become a favorite of the neighborhood kids as well. ABCD Diaries gives Save the Pie from SimplyFun an A+! 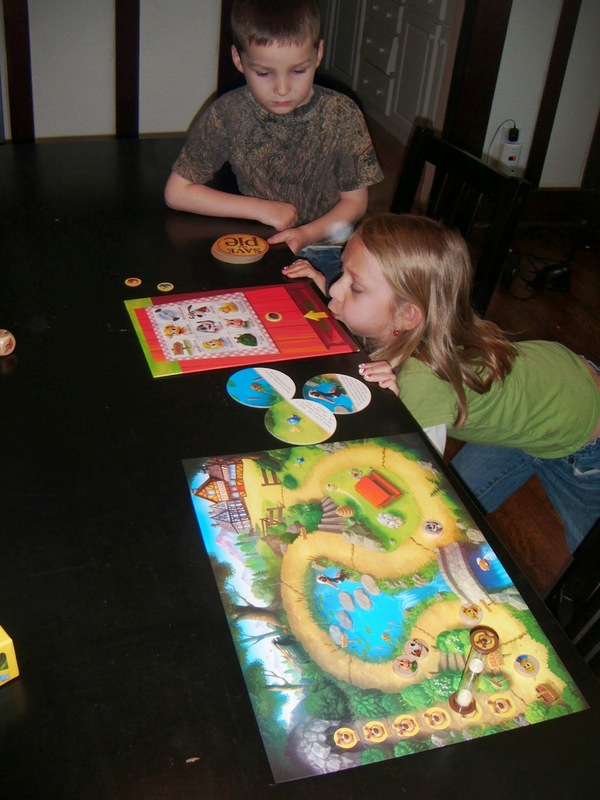 Buy Save the Pie and other super fun and educational games at SimplyFun! !